Here at The Smart Way our driving instructors are able to teach you how to become a safe and efficient driver, and therefore to pass your driving test. Our courses of driving lessons offer structured training at prices that represent excellent value for money, regardless of your age or experience, all delivered at a pace that suits YOU. We	may not be the cheapest, but the cheapest lessons may not always be the best lessons and may not work out to be the best value in the end. Not only are our instructors are committed to offering you the best training possible in the car, but we use unique study sheets to follow up on lessons for revision and to guide you towards your theory test. There are also practice quiz sheets to help reinforce learning. Your instructor will maintain detailed student progress records for both you and us to monitor your progress so that between us we can plan your progress to your practical driving test in the most efficient time (and by extension cost) possible. I am also pleased to say that we are one of only a handfull of driving schools in West Lothian to be able to offer driving lessons in an automatic car. If you are interested in driving lessons in an automatic car, click this link or see the link to the left in the main navigator bar. Why not join them? Contact us TODAY to get started on your lessons. The sooner you start, the sooner you TOO can pass and experience the freedom of being able to drive. When can I get lessons? 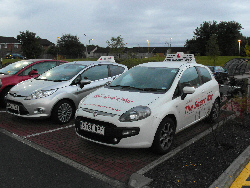 Our instructors offer driving lessons at a wide variety of times: during the day, in the evenings and at weekends, although outside office hours lessons are ALWAYS the most popular so please feel free to call, and we can discuss your need and our availability. Driving lessons are a minimum of an hour long and where possible we recommend two hour long lessons for the best progress. However we appreciate that this is not always possible or practical. We will tailor lessons to fit YOUR available time (and budget). Do you teach in my area? the whole of West Lothian, Livingston, Bathgate, Linlithgow, Armadale etc. However at times we do teach outside of these areas, especially if we already have students in your area. Please contact us on 07711 336452 to tell us where you are and we can see if we can do anything to accommodate your requirements - after all, we do have transport! We offer a full door to door service, you can be picked up at any location within our teaching area and dropped off at the same place, or any another (within reasonable return traveling for the instructor). For example, why not get picked up at work and dropped off at home, or vice-versa? In a word, Yes, or at least as much as is possible. The best progress is generally made by maintaining continuity between instructor and student as much as possible, therefore unless you need to change your lesson time or day significantly you can expect to keep the same instructor all the way through your course of lessons with us. Should YOU wish to change instructors for some reason, just call me and I will arrange to do this if I can (This will also be dependent on other instructors being available). Additionally, part of making the best progress is the discipline of having lessons at the same time each week. For this reason we ALWAYS make our best efforts to give you the same lesson "slot" from week to week. We operate a refer a friend scheme, if you recommend us to a friend who goes on to book lessons you get a one hour lesson free of charge. Currently referrals are one of our biggest sources of new customers. See our Customer Reviews page to see what other customers think of us. For those people with an urgent need to pass their driving test quickly we can recommend our intensive or semi-intensive courses. These can be done in the manual or automatic car and will be built exclusively around YOUR requirements, so call us for details. I like what I have read, how much will it cost me? We constantly monitor our lesson prices to ensure that we remain competitive. In addition we make a price promise to you. If our cost increase (fuel price rises etc) and we are forced to put our lesson prices up to our new students, we will NOT increase our prices to existing students. For us, an agreement is an agreement.